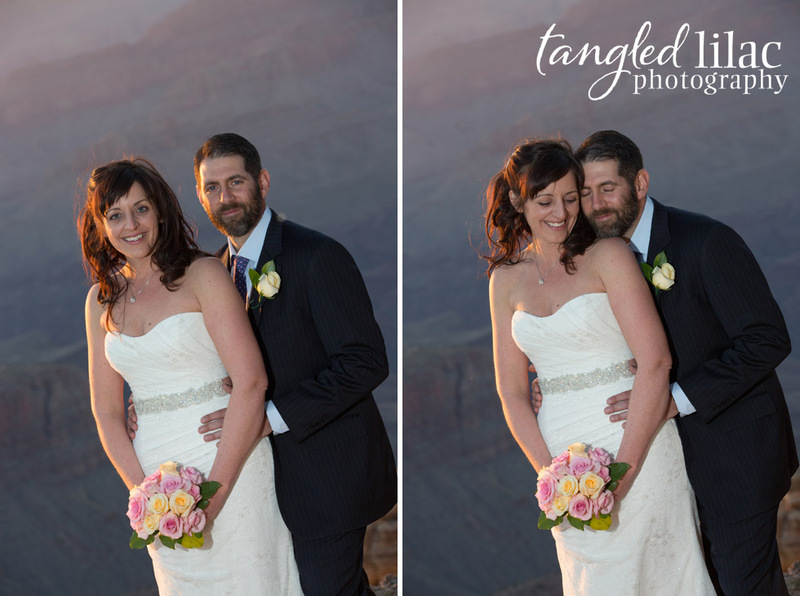 The Grand Canyon at sunset is something magical, and the evening of Julie and Jason’s ceremony was perfection. Together with their mothers and two daughters, this sweet couple exchanged their vows while overlooking some of the most magestic views in the world. 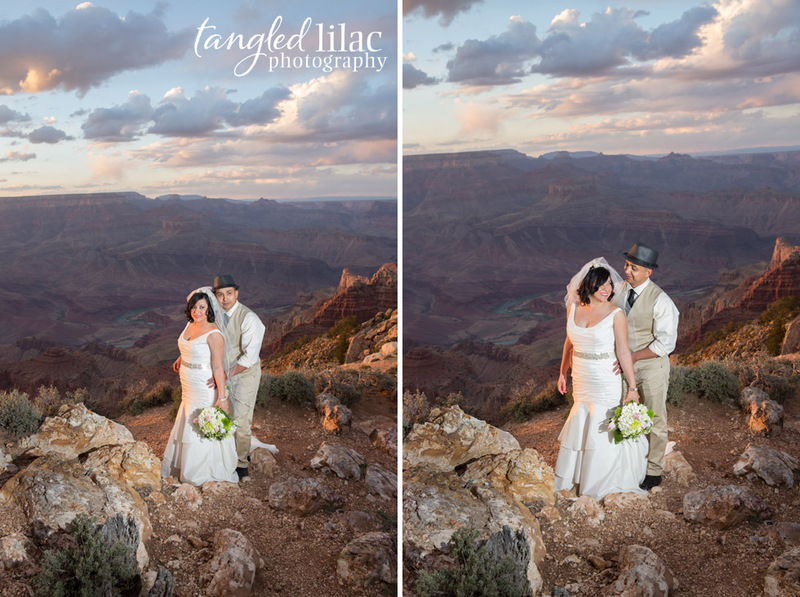 This beautiful couple picked one of the most beautiful overlooks at the Grand Canyon, Shoshone Point. This was the first time at the Grand Canyon for the entire family and it couldn’t have been a more perfect evening. 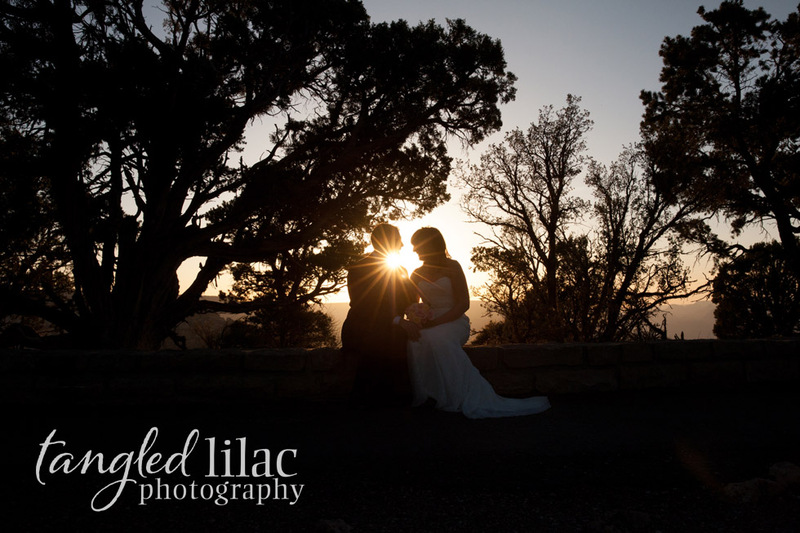 As Flagstaff and Sedona Photographers we are so lucky to get to go to some of the most beautiful places in the world. It’s evenings and families like this that makes our jobs so fulfilling! We wish you Julie and Jason a beautiful life! Congratulations! 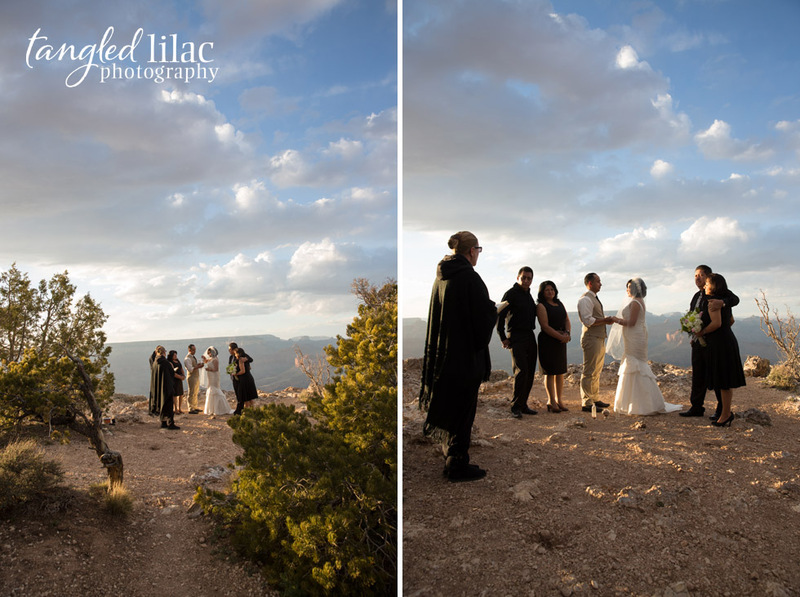 This past Saturday started out cold and windy and ended up absolutely perfect for Helen and Ricardo’s intimate wedding at Lipan Point. 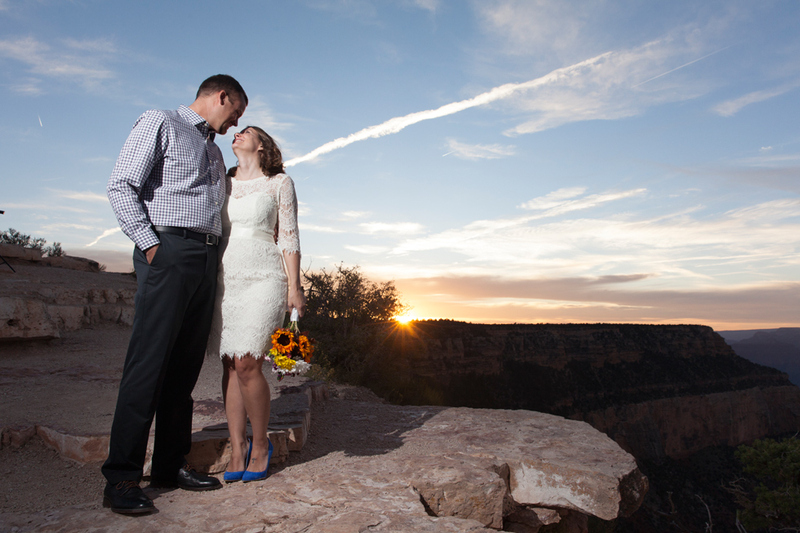 Helen and Ricardo were joined by their parents for their stunning nuptials on the rim. 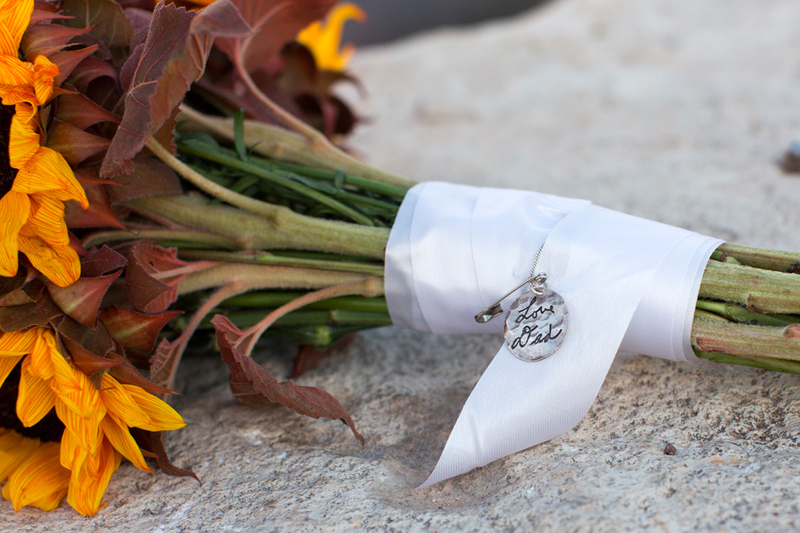 The ceremony was simple and sweet, the couple couldn’t have planned their day better. Congrats Helen & Ricardo! Since I’ve been a wedding photographer, I’ve come to expect the unexpected. I’ve seen couples panic from big issues like lost wedding gowns at the airport, incorrect catering and floral orders the day of the wedding, to small things like missing shoes, spray tan disasters and the dog-as-the-ring-bearer chasing a duck into the golf course pond. 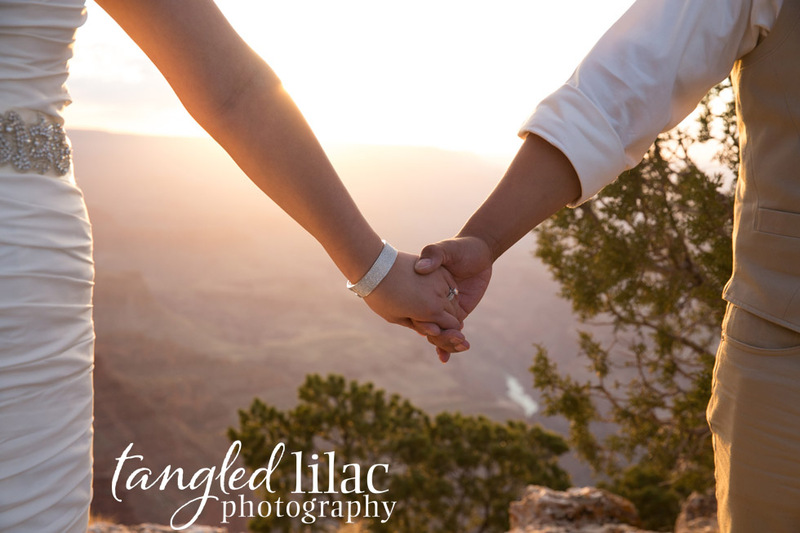 We, at Tangled Lilac Photography, always tell the couple to release all their expectations and to just embrace their day as it unfolds. More likely than not, a little something will go wrong, and more times than not, the couple does not even notice. That’s because it’s usually something so small and insignificant that in the big scheme of things, it doesn’t really matter. I wasn’t expecting this latest hiccup however. This morning at 12:01AM in Washington DC, the government shut down. But, what does this have to do with anyone’s wedding? 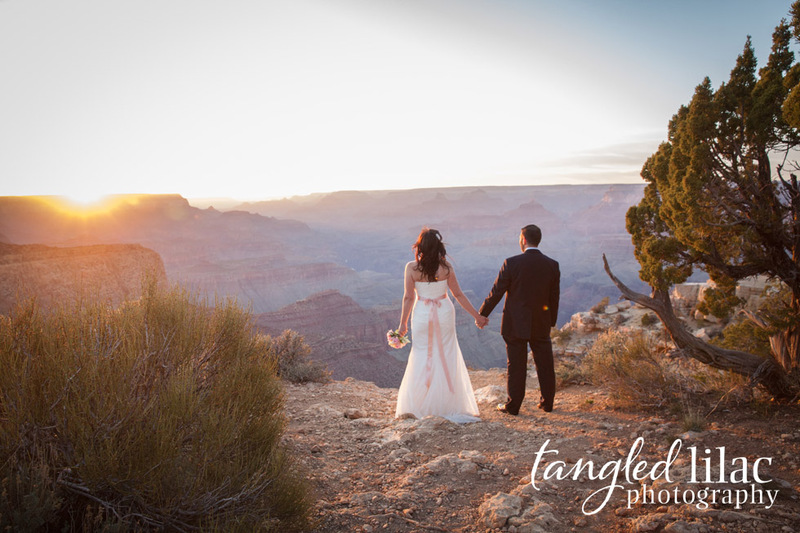 We at Tangled Lilac Photography photograph a lot of destination weddings at the Grand Canyon. If you’ve seen any of the photos there, you can see why so many couples from around the world are drawn to this majestic wonder of the world. It is a scene that conjures no words to adequately describe the beauty, serenity and magic of this place. We’ve had couples from Germany, Switzerland, New York, Maine, Florida, Kansas and all states in between that have been married while looking over the rim. 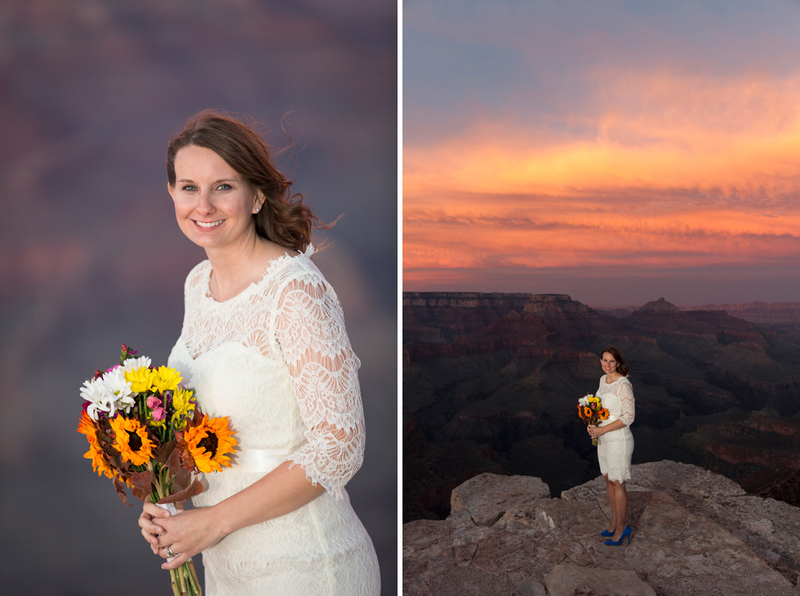 So, when we were contacted by our friend, Andrew, at Heart of Sedona, to photograph a Grand Canyon wedding at Shoshone Point, we were delighted. It’s definitely one of our favorite places to photograph in the world, and to have it in our own backyard is a fortunate blessing afforded to us living in Northern Arizona. What we didn’t anticipate is the Government Shutdown. 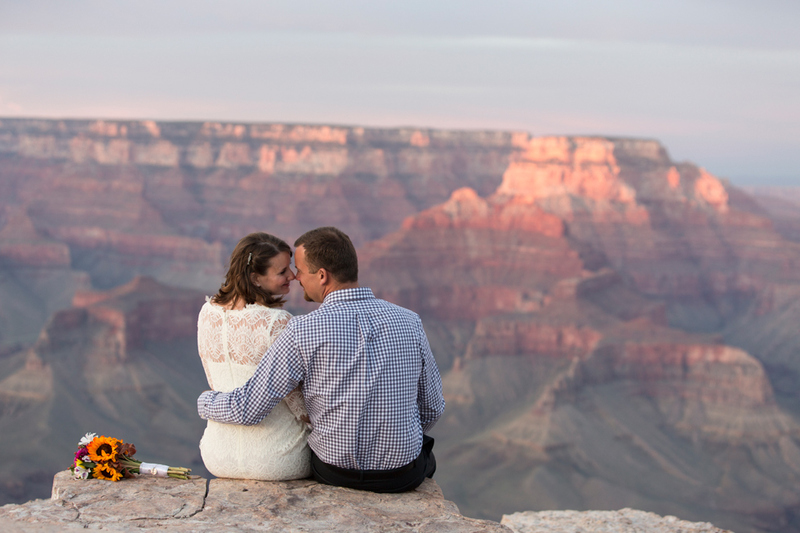 This morning, the gates at the Grand Canyon were closed, permits revoked and a “I’m truly sorry” was issued to the couple from New Jersey who we were scheduled to photograph tomorrow as they exchanged vows overlooking Shoshone Point. Lucky for the couple, they had the foresight to hire a great team of professionals. Andrew and I brainstormed and decided that a different location, not too far from their original destination, Merry Go Round Rock, would be a beautiful option. It offers a beautiful overlook and heartstopping sunsets. It’s going to be the perfect solution and, more importantly, gives the couple the peace to know they are going to have that perfect wedding after all. 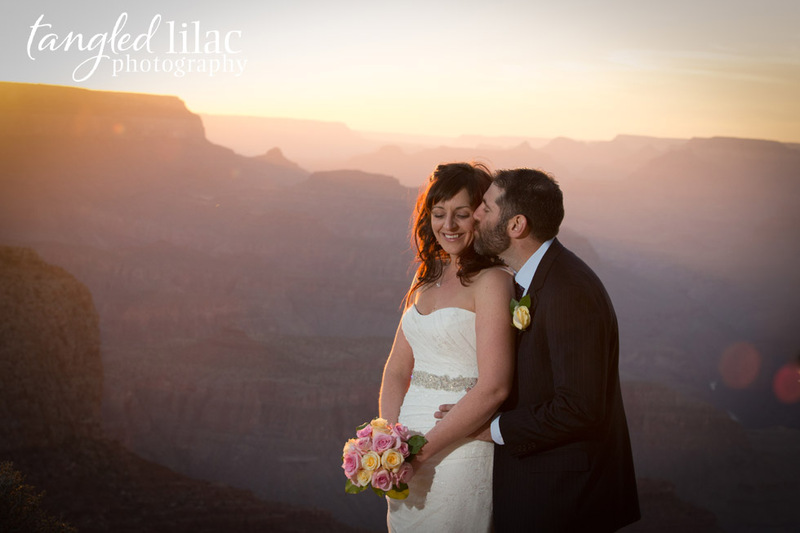 As Arizona wedding photographers, the Grand Canyon is one of the most beautiful and scenic places to get married. 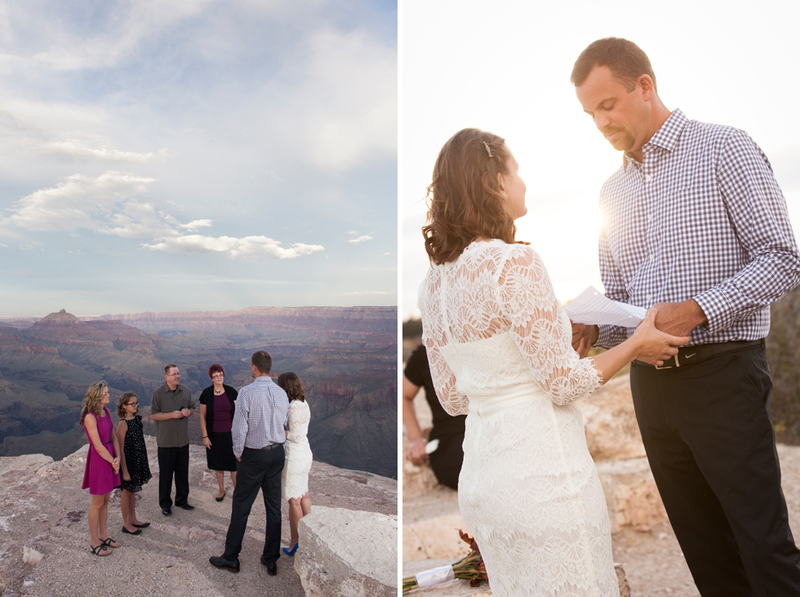 Meredith and Miles traveled from New York because they knew the Grand Canyon’s Moran Point would be a perfect spot for their intimate I do’s. This sweet couple invited just their parents to join them on their big day, keeping a secret from the rest of their family and friends until they returned from their honeymoon. 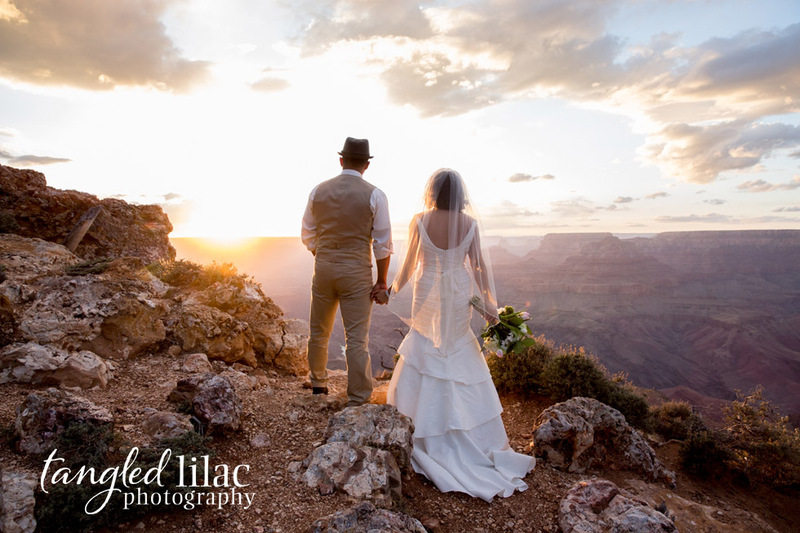 After their beautiful ceremony they celebrated with their family at the El Tovar and then backpacked into the canyon to Phantom Ranch for their honeymoon. What an amazing wedding and honeymoon! Meredith was nice enough to share how her and Miles met and some fun stories about their big day! Tell us about how you met? Miles and I met at a McDonald’s on the upper east side after a night out with friends. Miles approached my friend and I asking ” hey ladies what’s good here”. He claimed to be a lawyer but my friend and I didn’t believe him telling him we were both lawyers. He then told us that he went to Brooklyn Law School which we replied no we went to Brooklyn Law School. He then started naming professors and we finally were convinced. It turned out that miles and I lived near each other and ended up sharing a cab home to Brooklyn and have been together ever since. 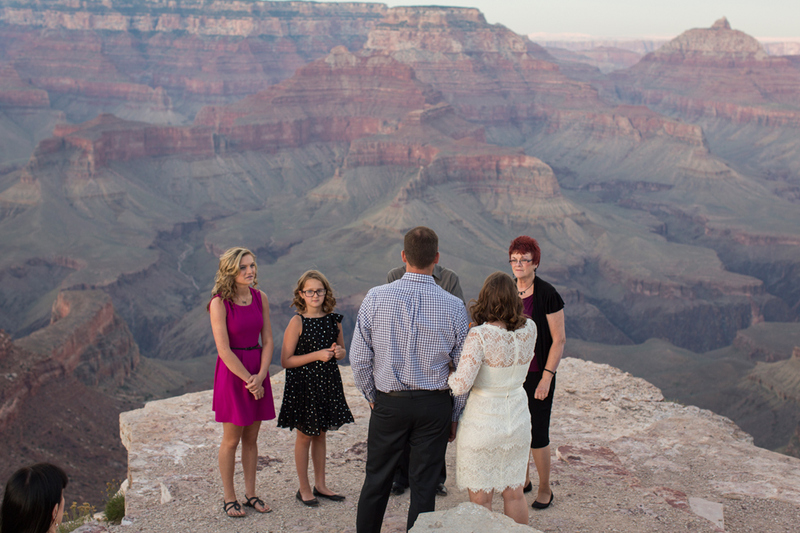 We had a small wedding at the Grand Canyon with just our parents. No one else knew we were getting married until we got home. It was tough for everyone to keep the secret but thankfully we had only planned the wedding a month prior so everyone was able to hold out. Meredith’s parents and Miles Dad and girlfriend had never met each other prior to the wedding weekend but were like old friends almost immediately. Our honeymoon was at Phantom Ranch at the bottom of the Grand Canyon. We hiked to the bottom the morning after our wedding and spend two nights at the bottom of the canyon before hiking back up to the rim. We explored Ribbon Falls and Phantom Canyon while we were down there. What type of things/hobbies/interests do you both have in common? Every bride wants to look beautiful on her wedding day, and we feel hiring a professional to pamper you on this special day is very important. Not only do you look your best, but it’s also a much needed relaxing experience in an already hectic day. Today, we welcome a guest blog from one of our favorite make-up and hair stylists, Christine DeAngelis of Northern Arizona Glam Squad, as she shares some of her thoughts on the importance of hiring a professional. “The most important reason for hiring a professional makeup artist for your wedding day is peace of mind for the bride. A bride always wants to look her best from every possible angle, both in person and for her wedding photos. Brides want makeup to last throughout the wedding day activities and ceremony. Additionally, a bride wants to look breathtaking for her new husband on their special day. A professional makeup artist can offer bridal trials, professional makeup products to fit a bride’s skin care needs, convenient on-location service, and their professional experience. It is always a good idea to have a bridal makeup trial. Your makeup artist will take the time to help determine which makeup products are best for your skin type, and overall bridal look while taking into consideration weather conditions on that special day. A makeup artist will document every product that is used on a face chart in order to re-create your bridal look. Then your makeup artist will photograph your final look for professional reference for your wedding day. During a makeup trial you will have the opportunity to discuss skin issues, makeup issues, facial flaws that you would like to conceal and facial features that you would like to accentuate. If you choose, your bridal markup trial could also include trying products including – but not limited to – airbrush makeup and false eyelashes. Trials give the bride the opportunity to discuss her bridal party’s makeup services and refine changes in her final wedding makeup look. In addition, professional makeup artists participate in extensive makeup education beyond the completion of their cosmetology schooling. Makeup artists are trained in skin care (skin type, common skin problems and skin conditions), high definition makeup, airbrush makeup, lighting concerns and professional beauty products. They keep up to date with the newest professional beauty products, and current trends. In addition, they are trained to know the tricks of the trade that will enable you to maintain a flawless appearance on your wedding day. A professional makeup artist also provides convenient on-location services for your wedding day. The bride’s time is a primary factor to consider on the wedding day. Salon services can be quite a distance from the venue location. Salons often run behind schedule and since your appointment will be booked in addition to the salon’s regular clientele bridal services may not be concluded in a timely manner, potentially putting the bridal party behind schedule. Professional makeup artists who specialize in wedding services only hire other makeup professionals who have a passion for creating that special wedding look. As stated previously, a bride’s time is valuable and her time should be spent concentrating on herself, the details of her wedding day, and her special guests. A professional makeup artist is experienced with all types of wedding scenarios. They are familiar with working under varied conditions and situational pressures, while ensuring services are completed in a timely manner. Some brides feel that hair and makeup services can be shaved from the budget, and decide to have a “friend or family member” do their makeup. In the beginning, this may sound like a good idea, but you cannot expect an inexperienced individual to have the same knowledge base and skill level required to create that special individualized professional bridal look that you expect.